We saw the touring show The Play That Goes Wrong, and I am not exaggerating when I say that I laughed as hard as I have ever laughed at a show. The show is an object lesson on how to milk a gag for its maximum effect. 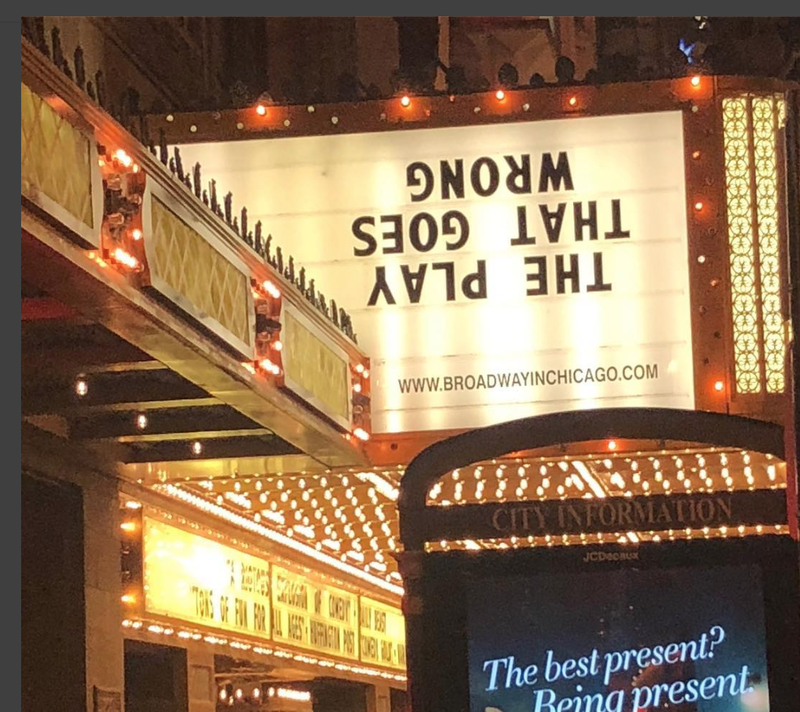 It's playing in Chicago through December 16, and if you like to laugh, I would highly recommend the show. 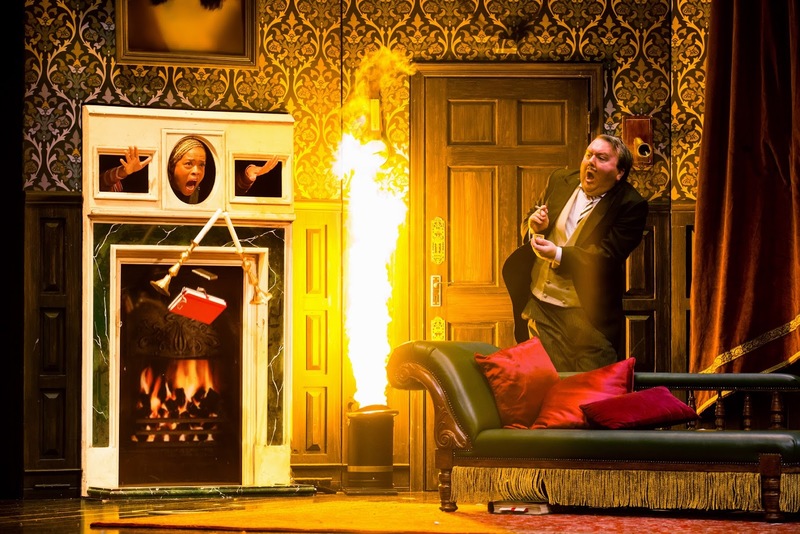 The Play That Goes Wrong will be presented through December 16. The premise of the show is that the Cornley University Drama Society is presenting a 1920's potboiler of a play, The Murder at Haversham Manor. In doing so, everything that can go wrong does in fact go wrong. Doors malfunction, people forget their lines, cues are missed, the set falls apart, actors misbehave, and even the director has a meltdown. Just some of the crazy shenanigans that go on in this supremely well-done farce. Photo provided by theatre. The show starts with an extended pre-show, so get there early to get into the swing of things, and you might even help the stage manager look for some missing personal items. All of the actors are quite good. My son's personal favorite was Trevor, the stage manager (played by Brandon Ellis). When we saw it in London, he was a surly working class guy with a thick British accent who could be quite rude at times. Here, he's a a surly working class guy with a thick Southern accent who can be quite rude at times. I think the British guy was ruder, but the belligerence from Trevor made up for it. Most of the other actors had British accents of one kind or another. All of the actors were great. I especially liked Ned Noyes, who plays Cecil Haversham. He plays the role with a kind of physical theatre bounciness, and gets caught up in the audience's applause to give them more of what they want. I also liked Evan Alexander Smith, who is very tall and thin, playing Inspector Carter (and the director of the piece) He is so tall, that he is nearly taller than the second story study that is part of the set. And Scott Cote as the butler Perkins, with a sad penchant for mispronunciation (cyanide is pronounced Sigh-A-Nide, not Cin-a-Node-Ee). I especially loved the way he looked at his hand just before he misspoke. He'd written himself notes on his hand on howto pronounce it, and he still got it wrong! Perhaps the hardest working actor in the show isn't alive at all. It's the set, which is beautifully designed to fall apart on cue and on command. 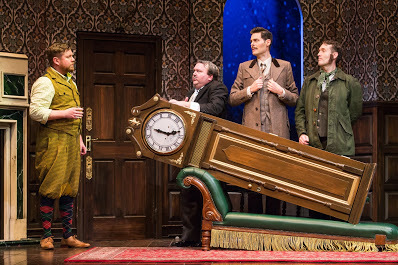 The set is supremely clever, and it's enormously technical, and I assume that there are occasions in which the set falls apart the wrong way, as it literally has many moving parts. Which leads me to an existential question: What happens when the Play That Goes Wrong Goes Right? I am sure it is still hilarious. Here's the promo video made for the show, and the bumper at the end contains some scenes from the show. Individual tickets range in price from $25-$98 with a select number of premium tickets available. . For more information, visit www.BroadwayInChicago.com.